Livestock production systems and some husbandry practices are prone to producing veterinary important entomological concerns. In addition, various arthropod-borne diseases―such as West Nile and some types of encephalitis―can affect both humans and animals. To circumvent these problems successfully, a solid understanding of veterinary entomology should be the foundation of comprehensive animal-health programs and production management practices. Veterinary Entomology: Livestock and Companion Animals is a comprehensive guide to the recognition, biology, importance, and control of insects and related arthropods that may be encountered in animal husbandry practices and with companion animals. 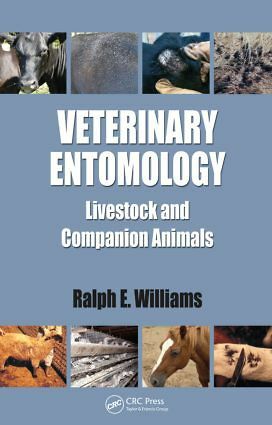 Unlike similar books, this single-authored textbook is focused exclusively on the veterinary aspects of entomology. In 15 highly readable chapters, it addresses the details of livestock/companion animal pest management within the current trends in pest management techniques and available technology such as pest surveillance and detection. Richly illustrated with more than 200 figures and a four-page color insert, the book discusses pertinent information on host–pest relationships, pest control methodology, identification, and biology of important pest groups, emphasizing those arthropods specifically associated with livestock and poultry production systems and those affecting companion animals. 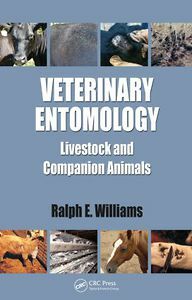 Written by a leading entomological expert, this book includes coverage of: Cattle Swine Sheep and goats Poultry Domestic pets Horses Veterinary Entomology: Livestock and Companion Animals is an excellent resource for all those involved with the handling and research of livestock and companion animals, as well as students in entomology, agriculture, and veterinary science.